RUSH: Sixty-five percent of Americans — two out of three — in a Rasmussen survey recognize that their constitutional right to own a gun was intended to ensure their freedom, that it’s not about hunting. Sixty-five percent see gun rights as protection against tyranny. Now, I know many of you wish that 65% were higher. Right now, given where we are elsewhere, I will take that number. I’ll take it. That is a number that’s not gonna sit well with the Democrats and the media after all of the attention that guns and the Second Amendment have received, with all of the literally living-in-a-different-world comments from people like Bob Schieffer and Tom Brokaw. What was it, Schieffer compared taking out the NRA to taking out Hitler! You know, the country still has water hoses and dogs being used. We still have slavery. Nothing’s changed. How in the world do you compare what’s happening now post-Sandy Hook and people buying guns and trying to protect and save the Second Amendment? They’re being equated by Tom Brokaw as the same people that oppose the Civil Rights Act. And, by the way, that’s another thing. Grab audio sound bite number one. I wasn’t even gonna use this, but here it is. Let’s grab it. 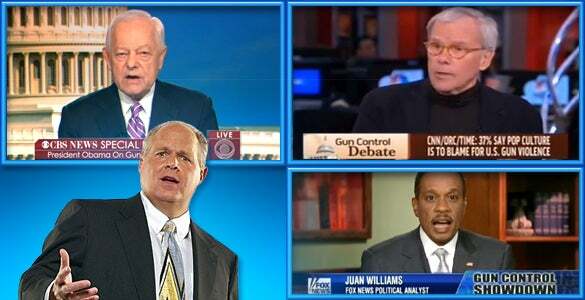 Juan Williams was on Hannity last night, and they’re talking about Obama’s gun control plan. Now, listen to this. RUSH: So now it’s racist! Adherence to the Second Amendment — appreciation, a desire to not touch it — is racist. Only white racist Southerners care about the Second Amendment. I have no doubt, by the way, that Juan Williams — a child of the Northeast who thinks he grew up in Selma — believes this, folks. I have no doubt that the people Juan Williams hangs around with at the Washington Post and NPR and wherever else he works, believe this, that the only people that care about the Second Amendment are the guys from the Old South. Lincoln didn’t finish wiping them out, damn it, and that’s their job now. BRINKLEY: In Texas, there’s a land commissioner that wants to basically allow everybody on public buses to carry guns and — and, you know, bring them into the state parks, and bring them every… You know, uh, gun… Almost like Archie Bunker used to want to hand out a gun if you go on an airplane so that everybody would be loaded and nothing can happen on the plane. That mentality’s just out there, but it’s Second Amendment craziness, and, uh, just this free speech has some limitations — we don’t go in and scream fire in a movie theater — you don’t have to have these kind of magazines, uh, to end up being a hunter or to have home protection. So some kind of reform’s gotta kick in. RUSH: So, the race is on. Second Amendment defenders are just a bunch of crazy racists, primarily in the South. They believe this. They’re not just saying it, folks, they believe it. So when they see this Rasmussen number, 65% of Americans — not 65% of people in the South, 65% of Americans — see gun rights as a protection against tyranny, that’s gonna tell ’em how out of touch they are. They’re not gonna want to admit it, and so they’re gonna just discount it, and it’s not gonna make ’em happy. RUSH: Here it is what Tom Brokaw said. Again, I’ve encountered this in my personal life. I don’t have to time to relate a story. I wish I did. I’ve got a break coming up. But I’ve encountered this. In fact, I was told that the reason a particular guy in Hollywood hated me is “because he probably marched with Dr. King in the sixties and he thinks of you as a Bull Connor.” I said, “This is the 2000s!” It didn’t compute, but now it does. These guys get locked into the formative experiences of their lives, and nothing ever changes. They got into journalism because of the ’60s civil rights marchers. They got into journalism for that reason and it remains the reason they’re there. Those were all Democrats that did that, Tom! So civil rights. What is the Bill of Rights, the first ten amendments? What’s the Second Amendment? Is that not a civil right, for crying out loud? RUSH: Now, look, I don’t want to make too big a deal of this, folks, this media stuff. We could spend all three hours every day on the media and not repeat ourselves. But I think it’s crucial. I think the reason why there are low-information voters is in part due to the media. People are on a quest for fairness in the American media, and there isn’t any. And I think it does help to understand who these people are and why they see things the way they do, how they see things the way they do. And this Brokaw quote, this is one of the greatest illustrations that I could use to make my point. Now, I don’t want to mention any names because these guys are still alive, and I don’t want them to end up being the focal point. But I remember one time I met an actor who I admired. I admired his work. I didn’t know anything about him. I just enjoyed his work. And I told him so. And he was off-putting and just this side of rude. I didn’t quite understand it. It wasn’t that long ago. This is 2013. It was the last ten years, easily, maybe not even that long ago. Well, it turns out that the civil rights marches, the Civil Rights Act, is one of the reasons that certain emeritus journalists got in the business today, because that story had everything they were taught wrapped up into it. Fairness, overcoming evil, power, speaking truth to power, all that stuff, racism, bigotry. All of these great things, combined with the unstated purpose of journalism, which is to change the world, “I want to make the world a better place.” That’s not what journalism’s about. But that’s why people go into it. So here comes Brokaw, and he goes on Al Sharpton’s show. 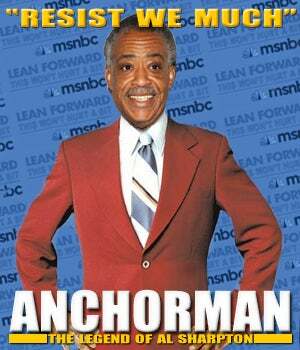 Now, 15 years ago, would Tom Brokaw have deigned to go on a show hosted by an Al Sharpton and give it his imprimatur? I mean, that itself is a sign of I think the destructive evolution of dignity and respect that’s happened throughout media anyway. Well, let’s get to what he said to Al Sharpton. This is about the Second Amendment fight and who these people are that don’t want to give up their guns. Who these people are that want to remain devoted to the Second Amendment. Who these people are that are defending the Second Amendment? In Brokaw’s eyes, you people who are devoted to the Constitution are the equivalent of Bull Connor and the Klan. It’s senseless. It’s illogical. Brokaw said, “It reminds me a lot of what happened in the South during the 1960s during the civil rights movement.” How? How does the government making moves here, various elected officials and public interest groups and gobs of other people trying to infringe on a constitutional right, how is that a reminder of what happened in the civil rights era? If that analogy were true, the modern equivalents of the Civil Rights Act is that you people defending and loyal to the Second Amendment are not the Bull Connors. You’re the Martin Luther Kings. You’re the people marching at Selma. You’re having your civil rights denied, or there are people who want to deny you your civil rights. So those of you who are not mobilizing to change the Second Amendment, those of you who are not mobilizing to make it more difficult to get guns and weapons, are the modern equivalent of people who sat around and let Bull Connor turn his dogs loose on the marches in Selma. Man, the foundation of what you must believe to be this out of phase. And then he said they let Bull Connor and the redneck elements in the South and the Klan take over their culture in effect and become the face of it. Now, Bull Connor and these guys are all Democrats. But you, in Tom Brokaw’s eyes, you are who are trying to defend a civil right that you have by virtue of the Constitution are the modern equivalent of people who denied civil rights to blacks in the sixties in Tom Brokaw’s view. That has governed the way he sees this country ever since it happened, and a lot of other journalists, too. Try this. If a lot of African-Americans back in the sixties had guns and the legal right to use them for self-defense, do you think they woulda needed Selma? I don’t know. I’m just asking. If John Lewis, who says he was beat upside the head, if John Lewis had had a gun, would he have been beat upside the head on the bridge. And these people that think like Brokaw are all over the media. This is the way they’re looking at this. So now what this has become, there is still slavery, there is still bigotry, there is still racism. It’s concentrated among people who are devoted to defending the Second Amendment, and they primarily live in the South. They are white, and they’re extremists, and they’re religious, and this is what they honestly believe. If it was true in the sixties, and whatever happened in the sixties to address the problems hasn’t fixed all the problems, then the problem must still be the same, must still exist, and you people trying to hold onto your guns are the modern equivalent of people — it’s cockeyed. But it is so explanatory. It explains so much of their worldview, of what they think of the country, how they cover civil rights news. They still do believe there is as much discrimination today as there was then. That it has not improved and that things like this are the proof that we still haven’t fixed the problem. That we haven’t even improved. We haven’t even made any positive steps. These are the people reporting the news every day. These are the people creating what’s known as the low-information voter. RUSH: Okay. So there’s some debate over whether Brokaw is a prisoner to the events that he witnessed and covered and lived through in the 1960s, or whether he’s an active propagandist knowingly spreading a bunch of BS. Yeah, I think it’s a combination of both, actually. But I do believe… I’ve run into enough of these guys and I know enough of them. These events in the past that have defined for them what’s wrong with this country, they truly believe. Once something is established as wrong, it never is right. No matter how many efforts are made — legislation, presidential act, no matter what — it never really gets fixed. It’s always gonna be a racist, slave country, as far as these guys are concerned. Whether they actively believe it or naively further the idea, they still believe it. They always will. George W. Bush can have over half of his cabinet be minority. That doesn’t count. Obama can have 2% of his cabinet be minority, and he’s praised for diversity, and when people pipe up and criticize him, media come to his defense. It was Republicans who named the first woman to the Supreme Court, the first women cabinet members, the first this or that. Right now it’s Republicans who have the only Hispanic members of the Senate. That doesn’t count. It doesn’t mean anything. It doesn’t refute the charge that Republicans are racists and bigots. It doesn’t refute the charge there’s still massive racism in the country. It doesn’t refute the charge that the Republicans are responsible for it. These narratives and templates get created. They exist because the effort, the purpose is the elimination of any opposition. It’s not news. It’s not the advancement of information or knowledge. It’s to further the majority cause of the left, in this case the Democrat Party. Everything that happens in the news today is designed to eliminate any effective opposition to Barack Obama and the Democrat Party, pure and simple. Every event that’s covered must first have that ability about it. Every event must give the media that ability to attack Republicans, to attack conservatives. If the story does not have that, the odds are it won’t be covered and certainly not extensively. FOXNews: Racist To Oppose President Obama's Gun Control Proposals?